Citroens have always been a little bit different, and perhaps this new one is even more unique than others. 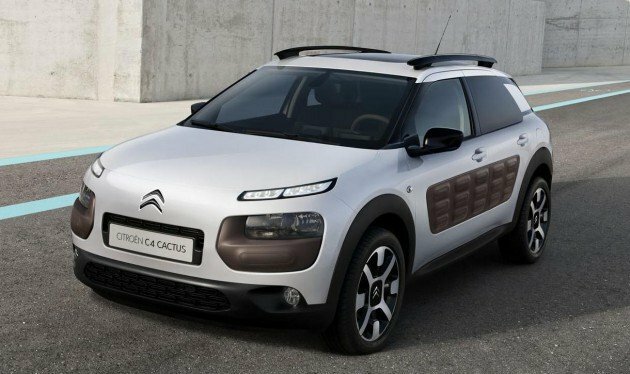 Full official details of the radical Citroen C4 Cactus have been released over yesterday’s leaked images, giving us insights of the brand’s, say, unique take on a C-segment vehicle. This is a “real alternative” to compact hatchbacks, according to Citroen. Its approach is an original one, especially when it comes to appearance. The earlier Cactus Concept’s split headlamps, ‘floating’ roof, upswept C-pillar, flat-dish wheels and 3D-effect rear lights are all carried over to the production version. Even the Airbumps – impact-absorbing soft air capsules to protect the body against minor bumps and scratches – have made it through to the production phase. Talk about being bold. Same goes to the interior, which has a few unique touches too. It has a seven-inch multimedia touch-screen display as standard, along with fully digital instrumentations behind the steering wheel. The button-type gear selectors also allowed Citroen to fit wide sofa-style seats at the front. Meanwhile, the front passenger airbag has been moved to the roof (Airbag In Roof technology) – a world-exclusive feature that creates more interior room and storage space. Another innovative addition is the panoramic glazed roof with advanced heat protection to let the light in but keep the heat out. Through the use of an “optimised platform” (i.e. not the new EMP2 modular base) and new engines, Citroen has managed to bring the weight down by 200 kg compared to the existing C4 hatchback. As such, the most efficient diesel variant will average just 3.1 litres per 100 km (32.3 km/l). the car is not pretty, but it surely is interesting. in a good way. Wonder how the airbag in roof works though. Citroen is usually quite a daring company, so yea. Airbump, that is interesting. 32.3 km/l is quite amazing for a crossover alike vehicle. Good idea to move the passenger airbag from dashboard to roof. Citroen always created some new and creative and useful feature to the market. Well done. But malaysia service center need to improve the service quality. Imagine you and Lisa Surihani on this cactus. I’ll just hump her like no tomorrow. Nice.. Looking forward to Citroen penetrating more into the SEA market.. Peugeot has done that via NAZA and i certainly hope NAZA would introduce Citroen too.. The current marketing and distribution network of Citroen in Malaysia is just not enough.. I like the body design. Smooth curve all the way.